The Champlin Park Marching Rebels invite you to join them for the annual Rebel Classic Invitational Field Show Competition. Featuring many elite regional bands, the Rebel Classic is divided into three classes by both school size and band size. The Rebel Classic is held annually on the first Saturday in October. Trophies are presented for all placements in each class. 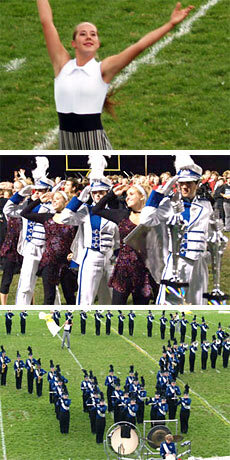 Caption awards are presented in each class to the outstanding percussion, color guard, winds, and drum majors. Bands wishing to expand their performance opportunities can also choose to participate in the afternoon contest at Anoka High School. That show begins at 1:00 PM and is just a 10-minute drive from Champlin Park High School. By participating in the Rebel Classic, you will be part of an evening of sights and sounds from many highly dedicated and committed young musicians. The Champlin Park Band Association is proud to offer your band the opportunity to be part of this exciting field show event. • An awards ceremony is held at the stadium immediately following the field competition.